As per KPMG, 81% of healthcare executives claim their organizations have been compromised by at least one malware, botnet, or other cyber-attack during the past two years. As a Covered Entity (CE), you have shared responsibility and liability for the actions of your Business Associates (BAs) and their vendors. You are liable for their actions and omissions. It’s the law, and penalties for lax oversight are steep. If you’re a BA or a vendor working with a healthcare CE, your liability also extends to the actions and omissions of your vendors and subcontractors. Don’t risk facing a tornado of costly penalties, and potential criminal prosecution with little warning. Easily manage dozens, hundreds, or thousands of BAs and Vendors from one location. Snapshot knowledge via intuitive dashboards & reports. Detailed audit trails and logs, including detailed reports. Allows for all downstream vendors and secondary business associates to get tracked and monitored. Gives security against millions of dollars’ worth of fines from negligence by Business Associates and Vendors. 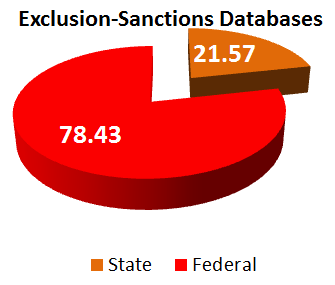 Checks for sanctions of Business Associates / Vendors / Employees / Contract Employees – Effective checks against 41 databases. Healthcare organizations cannot do business with excluded or sanctioned individuals or entities. The OIG has the authority to enforce exclusions against individuals or entities across all States under the Affordable Care Act. An individual or entity excluded in one State is not permitted to participate in federal healthcare funds in all other States. Any organization that hires excluded individuals or entities are liable for civil monetary penalties. In order to identify sanctioned entities, a health care organization may manually search through a litany of Federal and State databases. Integrity Manager, powered by proprietary algorithms, provides an automated comprehensive and continuous search for excluded individuals or identities across 41 Federal and State databases. This search is quick, accurate, and provides a summary for corrective action. No industry across the globe can survive without being compliant to some regulation or standard. Specifically, healthcare compliance has made significant advances in improving healthcare, including cracking down on fraud and abuse. Monitoring employees’ license and certification status is a compelling requirement for health care organizations and is a daunting task to deal with manually. And if a medical officer needs to practice in another State, a fresh licence has to be obtained. The implications could become serious, if healthcare organizations fail to detect licensing requirements and renewal dates. Failing to monitor employees’ licenses could result in an organization falling out of compliance with regulators, and ending up with liabilities by penalties and fines. In the United States, a big budget item is Healthcare spending. With approximately 20 million people working in healthcare providing services, unfortunately, fraud and abuse in healthcare reaches billions per year. Initially, enforcement placed a major focus on pre-hire eligibility. Now, with billions of dollars in fraud occurring, enforcement has begun placing a larger focus on monitoring employees beyond the initial hire. This effort addresses a gap in communication, where employees could get hired before a previous fraud has been reported. In protecting themselves against employing unlicensed or sanctioned individuals, leading health care organizations and hospitals are moving away from manually monitoring license renewals to more technology enabled solutions. The forward-thinking leading organizations are starting to adopt automated and integrated medical license monitoring solutions. These solutions provide continual coverage throughout the year, cut down on labor and help organizations maintain compliance. Integrity Manager provides one stop check on all these. With access to extensive databases, Integrity Manager quickly scans and presents the exceptions/exclusions/employee checks.